An EKG or ECG is an electrocardiogram that is used to monitor the activity of the heart. Each beat of the heart is initiated by an electrical impulse generated within the heart itself and the EKG records these impulses as they travel through the heart. Abnormal EKG waves signify problems in the conduction and can be used to diagnose various heart conditions. The University of Utah Medical School explains that an EKG is a non-invasive and painless test that is recorded with a standard 12- or 15-lead electrocardiogram. These leads detect electrical conduction traveling in the heart from various locations on the body. The leads are electrodes that are attached to the chest, arms and legs with sticky patches. Doctors use EKG recordings to assess whether the heart rhythm and heart rate are at a consistent, even rate. An unusually fast heart rate, or tachycardia, and slow heart rate, or brachycardia, can be difficult to accurately detect without EKG tests. Irregular heart beats can also be recorded with an EKG and depending on the wave form, the doctors can see which part of the heart is affected. EKG readings consist of several segments, each representing a stage in the heart beat cycle. The isoelectric or baseline shows an absence of any electrical activity when the heart rests between cycles. Abnormal EKG readings can signify different areas and stages of heart problems. Merck notes that one example of an abnormal EKG reading occurs in the initial stages of a myocardial infarction, or a heart attack, when the T wave is abnormally tall. Heart muscle injury is also shown by an elevated ST segment in the EKG wave. The Q wave portion of the EKG remains abnormal even after the heart attack. 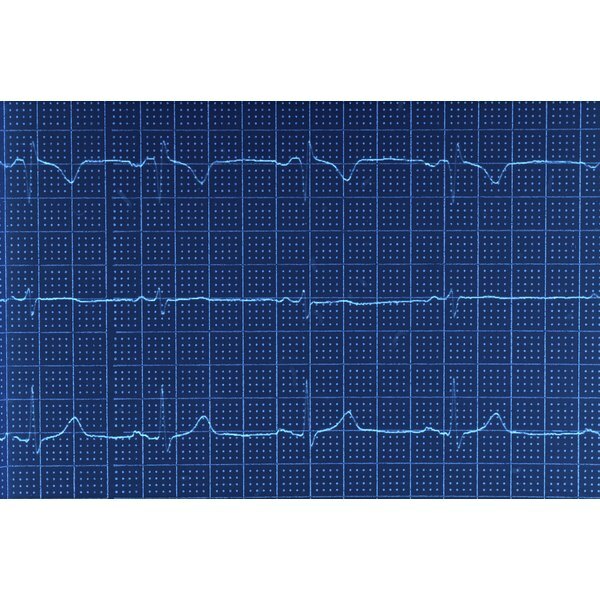 A normal EKG wave shows that the heart is functioning correctly. Abnormal EKG waves can vary depending on the problem and area of the heart affected. The Mayo Clinic lists several heart problems that can be detected with an EKG including arrhythmias or irregularities in the heart rhythm, heart valve problems, coronary artery disease or blocked, narrowed coronary arteries, angina or chest pain, a current myocardial infarction or heart attack, and a past heart attack. Medications that treat high blood pressure and other cardiovascular disorders, such as beta blockers, can also cause arrhythmias. The Mayo Clinic advises that electrocardiograms are safe procedures with no risk of adverse effects. In some cases an EKG may be performed in conjunction with a stress test to measure the performance of the heart. The stress involves exercising to evaluate the function of the heart and can cause an irregular heart rate and, very rarely, a heart attack. Additionally, there is no risk of electrocution during an electrocardiogram because the electrode leads detect and record electrical activity from the heart, but do not emit any electricity. What Causes Fluid Around the Heart? Does Low Potassium Cause EKGs to Change?